CHRIS CORNELL returns to New Zealand in November for a solo acoustic tour. In celebration of the release of his new album Higher Truth tomorrow (through Universal Music), Chris Cornell has confirmed a third and final night at Auckland’s ASB Theatre on Saturday November 28. 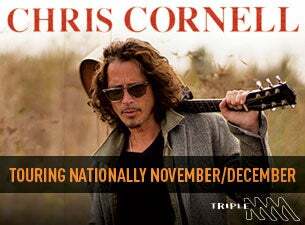 The tour will provide fans the chance to see Cornell perform songs drawn from throughout his entire career, as well as new songs from Higher Truth in an unplugged, up close and personal setting. Tickets for this new Auckland show will go on sale 10am Friday, September 25. My Live Nation members can secure tickets during an exclusive pre-sale beginning Wednesday, September 23 at 1pm. Chris Cornell - multi-Grammy award-winning, Golden Globe nominated and acclaimed singer songwriter - is an innovator who transcends genre. He was the chief architect of the 90s grunge movement and retains one of the best rock voices of all time. Achieving multi-platinum success with three legendary bands, Soundgarden, Audioslave and Temple of the Dog – and in the process selling more than 30 million records worldwide - he has forged his own unique identity over three decades as an iconic and universally acclaimed songwriter, guitarist, composer and lyricist. Chris Cornell’s career began with Seattle trailblazers Soundgarden, whose wild soundscapes combined visceral punk attitude with artistic depth. Powerfully original, they were the first of their generation of Seattle bands to sign to a major label in 1989 and their work continued to evolve over the course of seven groundbreaking albums. Soundgarden made a historic return to the live stage in 2010 and have since toured the world, releasing the all-new studio album, King Animal, to widespread acclaim. Higher Truth, his fifth solo studio album to date, reflects an expressive intimacy similar to that of Songbook, while also displaying his evolution and growth as a master craftsman songwriter. This new powerful addition to his catalogue will be released tomorrow.